SALT LAKE CITY (AP) — A candidate for a new, moderate third-party is bringing a trove of cash and a little Mormon humor to a northern Utah congressional race against a longtime Republican incumbent. 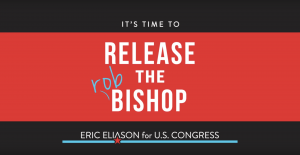 Businessman Eric Eliason is facing an uphill climb in the three-way race to unseat eight-term U.S. Rep. Bob Bishop in a heavily Republican district, but he could be bolstered by anxiety some voters feel about President Donald Trump as well as partisan wrangling in Washington. He’s one of more than a dozen candidates the United Utah Party is fielding after another third-party candidate made a mark in the state’s 2016 presidential vote. Eliason’s messaging will soon turn to weightier issues, and he hopes to do well enough in polls taken in the coming weeks to participate in the race’s main debate. “For us, it’s almost the quality of our primary, it’s the election before the election,” Eliason said. He’s got about $195,000 in cash on hand to get his name out. Much of that is his own money, but he’s also attracted big-name donors like Utah Jazz executive Greg Miller. His haul is dwarfed by Bishop’s $561,000, but far outweighs Democrat Lee Castillo, who has raised and spent about $5,000. Castillo, meanwhile, is betting that the addition of a third party in the 1st Congressional District race could fracture the Republican vote, leveling the playing field for the social worker and gay single father, campaign manager Sheila Raboy said. Bishop, for his part, expects the two challengers to split voters dissatisfied with his tenure, while he wins re-election from those happy with him, campaign manager Kyle Palmer said. Bishop has represented Utah’s 1st Congressional District, which includes the cities of Logan, Ogden, and Park City, for 16 years. 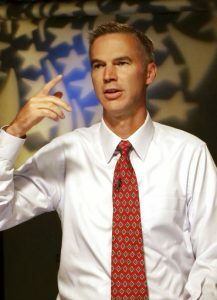 The chairman of the powerful House Natural Resources Committee has said that this will be his last congressional race. Third-party candidates haven’t historically fared well in Utah, but in 2016, former CIA officer and independent conservative Evan McMullin earned a healthy 21 percent of Utah presidential votes. Eliason has hired McMullin’s former campaign manager. On issues like public land, Eliason takes a nuanced approach but disagrees with Bishop’s support for downsizing two sprawling national monuments. He says the congressman is too influenced by big donors in the oil and gas industry. Bishop has argued that oversized monuments hinder land uses like energy development and grazing. 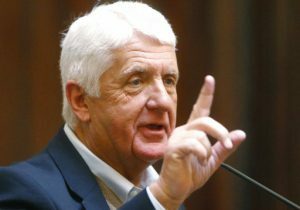 Bishop is a former school teacher who can’t afford to fund his own campaigns, but he wants to broaden access to public lands to benefit regular people, Palmer said.